There is a “National coalition of Private Schools” launched about a year ago, that is also seeking our advise and collaboration regarding certain vexing problems in the area of education. We have been attending some of their meetings and sharing concerns in areas that also affect us. 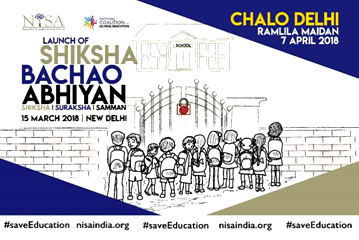 Yesterday there was an official launch of the “Save Education Campaign”” in Delhi. 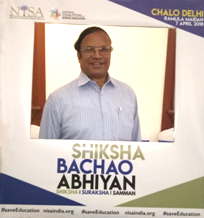 Some of the concerns are: Ease of Opening Schools, Recognition of Schools and Choice of Board; Not reimbursing the expenses met for the 25% admissions given EWS students, concerns regarding TET for teachers already teaching; rewriting history, School Autonomy, threatening with de-recognition, policy flip-flops by the CBSE Board; Corruption in granting of NOC; All rules only for Private Schools etc. This movement is expected to culminate with a massive rally on the 7th of April 2018, from 10.30 A.M. to 2.00 P.M. at Ramlila Maidan, in Delhi. 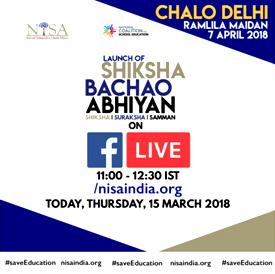 National Independent School Alliance (NISA) an umbrella organization that runs low cost private schools and 90 other Founder Body key stake holders have formed this large platform called “National Coalition of Private Schools” who have launched this movement and the forthcoming rally on the 7th of April 2018. As i mentioned above, they have sought our collaboration as some of the issues also affect us in our education ministry. The campaign needs our magnanimity, solidarity and collaboration as we all know very well that the current scenario will affects adversely the future of millions of children in the country. Different organizations and Founder Bodies are pitching in their support. 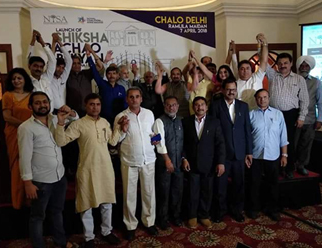 One of the interesting pledge yesterday at the launch of this campaign was a committee of educators from Punjab agreeing to get the local Gurdwara in Delhi to provide meal for one lakh (100,000) people who come for the rally. There are very many common concerns that affect us also as you know very well. Education is an area that will affect every citizen of this country. Every interested organization or individuals need to pitch in and contribute to the education of children as even now 50 lakh children are still out of school. Our institutions stand for inclusive education, care for the marginalized, academic excellence, holistic education, care for the environment, formation of character and value based education. We also want the policy makers to respect the rights of the minorities to establish and administer their own institutions without undue interference and harassment. 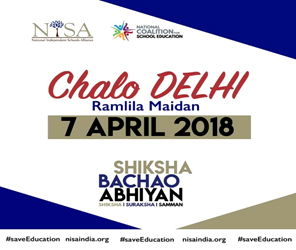 Therefore I would request and invite all those who can to participate in this rally that has been planned for the 7th of April at Ramlila Maidan in Delhi. 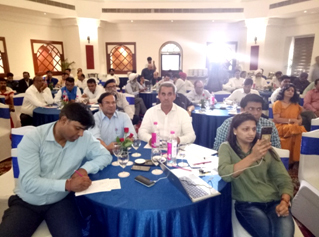 All the institutions in Delhi and in the neighbouring States are invited to show much interest to make this campaign a success so that the children in our country can receive quality education that they all deserve. This is a campaign for good education not against the Government or against anybody.